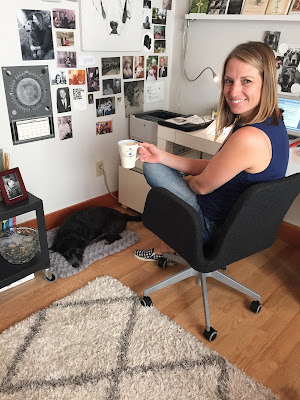 I’m Julie Barton, a writer and mom of two daughters, ages 11 and 8. 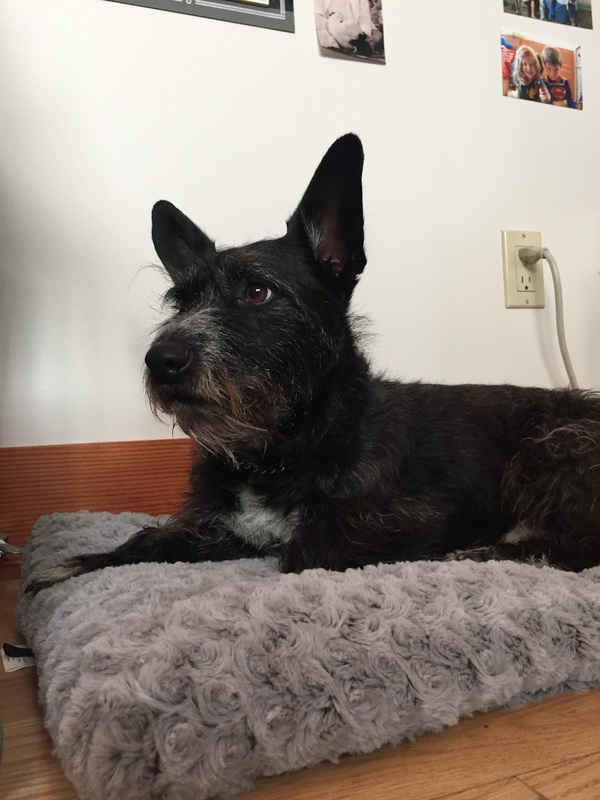 Lying down next to me is dog Jackson, our 8-ish-year-old mutt, who we recently learned, via a pricey DNA test, is part Australian Koolie, part Chinese Crested Terrier, part Beauceron and part Greyhound. On weekdays, I have coffee every morning with Jackson. After the kids leave for school and my husband leaves for work, I make a latte and head to my desk. Jackson follows and settles in on the dog bed right next to my chair. Any treats for you or Jackson on this occasion? This morning I’ve got cereal. Pretty boring. Nothing for Jackson. He already ate, and I think he’s the only dog on the planet that doesn’t like dog treats. The only treat he has ever consistently liked is lunchmeat, and even then he loses interest after a few bites. How were you and Jackson united? I was thinking about getting a smaller dog and wanted to get a rescue. 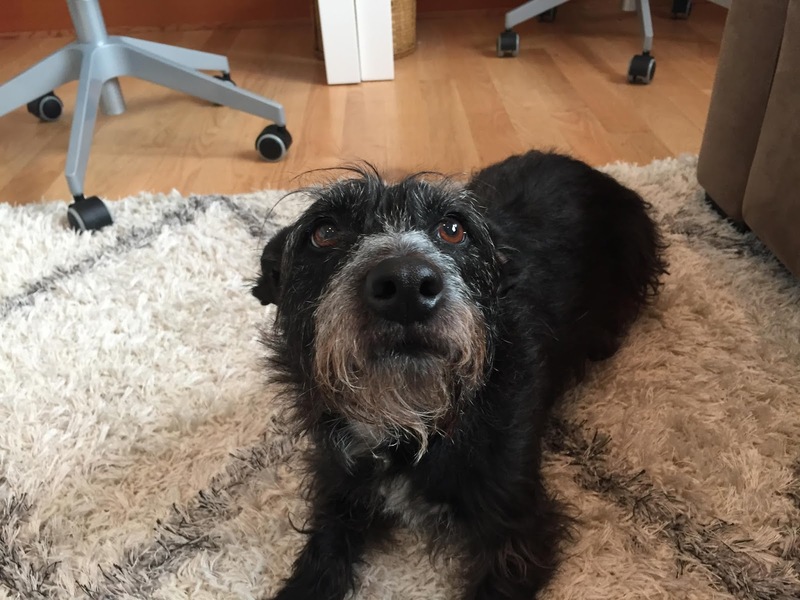 I found a middle aged Scottish Terrier on the web site of an adorable rescue in San Francisco called Wonder Dog Rescue. http://wonderdogrescue.org I contacted them and they said that the Scotty had been adopted, but that they had this new small black dog, about a year and a half old, that had just been surrendered. Apparently, we are Jackson’s fourth home. I don’t know much about his three other homes; I just know we are his last. Does Jackson do more to help or hinder your writing? He helps, mostly. He’s usually quiet when we’re at home and will always give me a kiss if I ask for it. And when I take a break and pull out the leash to take him for a walk, he’s so happy that it’s infectious. The only distraction: I can be in the middle of writing, focusing on something intently, and if he hears a threatening noise (aka, a child on a scooter or skateboard), he barks so loudly and urgently it jolts me out of my chair. 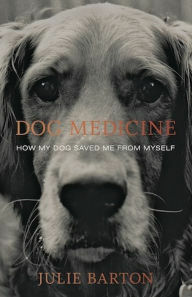 Would you tell us about your new book, Dog Medicine: How My Dog Saved Me From Myself? It’s the story of how, when I was 22, I was diagnosed with major clinical depression after a difficult first year out of college. Nothing helped until I adopted a golden retriever puppy who helped me begin to heal. 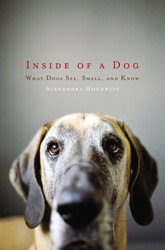 Dog Medicine is about love and learning to accept healthy love, both the canine and human varieties. How were you and Bunker united? My mom and I found an ad for Golden Retriever puppies in the Columbus Dispatch classifieds. (It was 1996. Pre-internet.) The ad led us to a small family farm in Alexandria, Ohio, where Bunker was waiting for me. What was Bunker's best quality? I can’t possibly list them all here—but his sensitivity to mood was incredible. He leaned against me whenever I was having a hard time. He also went through a lot, at a young age, and showed me what resilience looked like. His fur was a beautiful dark red; a lot of people mistook him for an Irish Setter. His ears had the best little kinked curls, and he howled whenever he was happy. Back to Jackson: if he could change one thing about Californians, what would it be? That people build less and leave more open space for him to run. Also, dog-friendly everything please. If Jackson could answer only one question in English, what would you ask him? What would you have asked Bunker? Jackson: I would ask him what he has against scooters/skateboards and why he has to bark like a maniac every time he hears one within a two-mile radius. Bunker: I would’ve asked him if he knew that he had saved my life. If Hollywood made a movie about your life in which Jackson and Bunker could speak, who should voice them? Jackson: A young Fred Savage (Wonder Years era). Bunker: I don’t think anyone could do Bunker justice. What advice would Jackson give if asked? 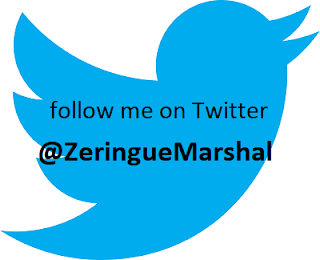 Like Dog Medicine on Facebook, and visit Julie Barton's website, Facebook page, and Twitter perch.